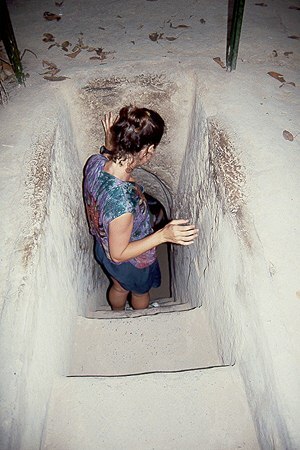 Entering the enlarged area of the Cu Chi tunnels. There were 200 km of tunnels here, stretching to Saigon. and into some American bases. They were used to shelter an under-ground army and enable them to make surprise attacks before disappearing back through camouflaged trap doors. A trip below is very interesting but not for the claustrophobic. The Command Center of the subterranean village. Several stories deep were housed kitchens, hospitals, living and storage areas and munitions factories. Dug using the most rudimentary tools, the 10 -13ft thick roof could stand the weight of a 60 ton tank and the impact of 100kg bombs. 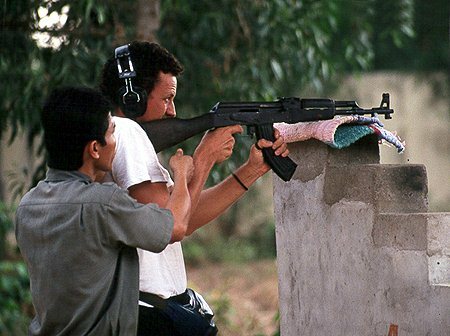 If you are so inclined, this is your opportunity to fire an M 16 or an AK-47. All you need is a $1 a bullet and some borrowed ear protection.. 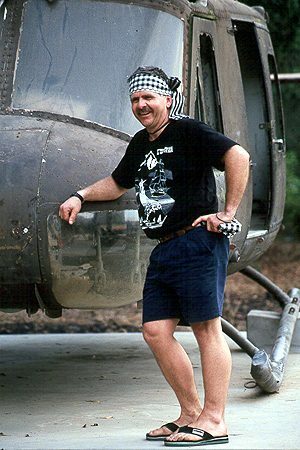 Here also you will find an abandoned Huie helicopter and a knocked our M-48 tank. 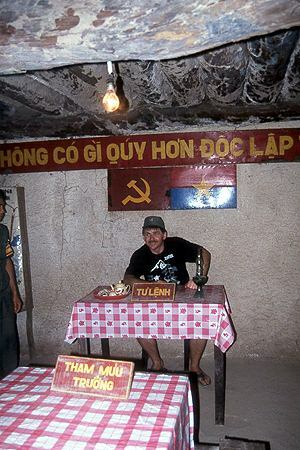 During our introductory lecture from a uniformed ex Viet Con officer, a violent thunder storm erupted, setting the scene for our trip below ground.